The world is constantly into witnessing changes. Every technology, every activity are changing with immense speed making the living easy and comfortable. One of the major industry that witness to constant development and prone to constant change is the electronic manufacturing industry. The history of electronic manufacturing industry dates backs to the 20th century. After sailing miles, today the electronic manufacturing industry is equalized to a global industry statue. Innovations keep popping up in the industry and bringing new changes in the business sector. As the industry is always in the path of development, it is necessary to equip every business processes with the latest innovative techniques and business formula. If we take the electronic manufacturing industry, the major processes happening in the industry are designing, manufacturing, testing, distribution, and servicing. For this reason, it is necessary for an electronic manufacturing industry to possess an ERP, and have a proper backup from the reliable software and control the overall business function. Odoo/Open ERP software comes with much advanced and adaptive features helping the electronic manufacturing industry to streamline their business functions and operations. The electronic manufacturing company is into the production of electronic components such as transistors, capacitors, resistors, integrated circuits etc. They can also be into producing televisions, computers, mobile phones etc. The work process happening in both cases are almost similar. Precision, quality, and error-free environment act as the must factor for the electronic manufacturing industry. An efficient ERP software like Odoo ERP for electronic manufacturing industry helps in managing the all internal and external business operations. This blog discusses the benefit of ERP in electronic manufacturing industry. a) Proper maintenance of sales, accurate production via forecasting. c) Top notch quality raw materials for carrying out production. d) Adoption of latest market trends/demands. An ERP software like Odoo facilitates with numerous functions for managing the business inventory, quality maintenance, supply chain activities, customer relations, employee management, production planning, accounting and more. 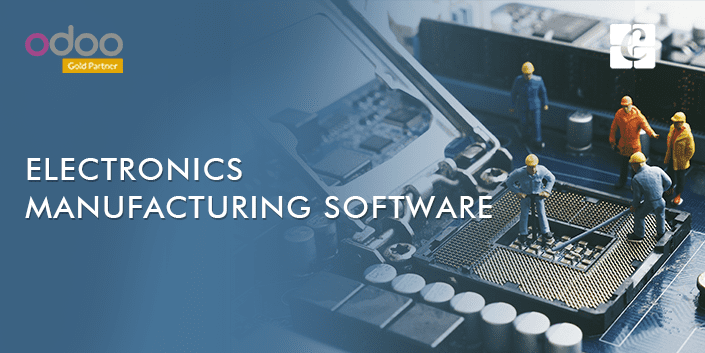 An ERP software in electronic manufacturing industry end results with reduced inventory costs, accurate production, assurance of good quality raw materials, time-saving production patterns, fastest delivery, customer satisfaction and more. 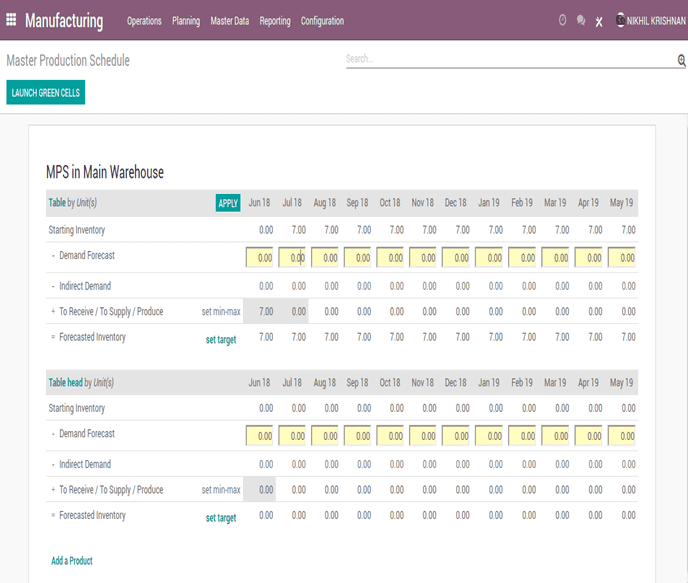 The extravagant features in Odoo ERP like the master production scheduling, batch, and serial number traceability, warehouse management, customer relationship management and more help in achieving qualitative results in the electronic manufacturing industry. Let us look in detail. In order to start production, availability of sufficient and high-quality raw material is an inevitable factor. In the case of the electronic manufacturing industry quality check comes as a must factor as it directly affects the electronic products delivered in the end. There will be some standard quality parameters for every raw material used in the electronic manufacturing industry. These parameters can be set in the quality control feature of an ERP software, helping the electronic industry to always adhere to their standard norms and protocols. During the onset stage i.e. initial reception of the raw materials, an ERP can be put to action. ERP can be facilitated with the job role of quality control of raw materials. An ERP in this stage can help with the assurance of raw material quality, and later certifies and authenticates for further course of action. The quality control points in Odoo ERP helps in triggering quality checks in each production stage, ensuring the material quality of each stage. Odoo ERP in electronic manufacturing industry thus notifies quality clashes if any via critically and keenly analyzing the various production stages. The product formation is totally depended on the bill of materials. In the case of the electronic manufacturing industry, there will be a lot of additional components like product parts and accessories. Therefore bill of materials is a must. Also for the making a particular electronic product there will be a main component and a subcomponent. To handle these, multi -productions, multi-level bill of materials is mandatory. Odoo facilitates multi-level Bill of Material for conducting seamless productions. Cluttering of multiple materials is evaded with the function use of multiple level bill of materials. Since multiple productions take place, the electronic manufacturing industry encompasses multiple work locations. Managing multi warehouses is strenuous. An ERP like Odoo helps in the seamless management of multi-warehouses, via allocating real-time communication and streamlining every interrelated function. The implementation of ERP in electronic manufacturing industry helps with creating manufacturing or work order to specified warehouses, syncing every action in real-time. A well defined and streamlined inventory underlines the success of electronic industry. Any mismatch in the inventory leads to catastrophic consequences. So a well-arranged inventory management can be executed using an ERP software. Odoo ERP inventory comes with many intuitive features for effective management of business inventory. Features like delivery order, stock transfers, barcode code helps in easy tracking and flawless stock movement. The features like negative inventory help with pre-planned production eliminating resource wastages and additional business expense. In an industry like electronic manufacturing, faulty products or scraps are not so uncommon. Due to the fragile nature, most of the raw materials end results with scrap formations. These should not get bloated in the inventory as it paves to huge confusion in the later period over good and faulty ones. The scrap management function in ERP helps the electronic manufacturing industry from inventory bloating. Here using the scraping feature, every waste materials are moved to a separate location and are handled separately. The major concern with respect to E-waste management is ruled out and carried seamlessly with ERP software in electronic manufacturing industry. In an industry like electronic manufacturing, it is very necessary to produce items according to the order. It is because the raw materials and production process is costly when it comes to electronic manufacturing. So accurate production shall always be ensured to avoid unwanted loss. The production shall also be based on the market demand of the product. To make all this happen the ERP software can be made use of. 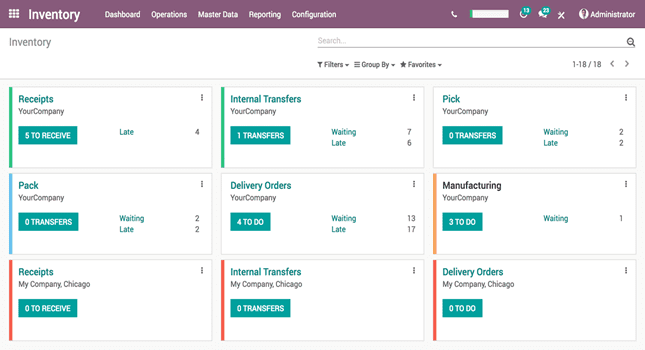 Odoo/Open ERP system has got the master production schedule which can be used for demand forecasting so that precise production is ensured with. To drive the electronic manufacturing industry forward, it is necessary to have a crystal clear view of different functional areas in the industry. Complete knowledge about stocks, items received, items purchased, items delivered etc. shall be known to keep up the regular follow up of industry operations, thereby reducing the resource wastage and unnecessary economic loss. As the ERP comes integrated with other management modules like accounting, sales, customer relations, human resource, it helps the electronic manufacturing industry in streamlining their departmental operations from a unified database. It is very necessary to have knowledge about the company’s growth rate, performance etc. in order to put new products and business strategies. To make this happen detailed reports are necessary. 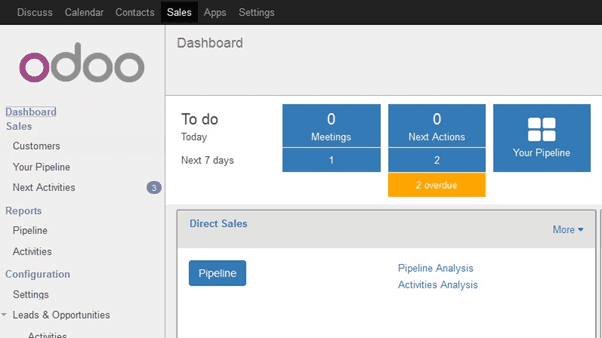 The Odoo/Open ERP software supports report making a feature. So the electronic manufacturers can create reports about his business and hence make new plans for business if it is not good as he expected or if he has to improve his business to an even more better level. Customer satisfaction and customer retention underline the success of any business. It is very important to have an established and proper sales to ensure a successful run of a business, so is the case of electronic manufacturing industry too. As the competition is very stiff in this field, necessary strategies should be put forward to attract customers. To make this happen the ERP software for electronic manufacturing can be made use of. With the customer relationship management, the manufacturer can maintain a healthy relationship with their client, understand their buying trends, and can also offer discounts and loyalty offers for regular customers keeping them inclined to the company. The customer relationship management of Odoo is robust as it enhances in real time communication with customers and brings in better sales analytics. The electronic manufacturing industry is something which works at a fast pace. They should deliver the product to customers hand without any lapse. Timing is very important here. With the help of Odoo ERP, the electronic manufacturing industry can seamlessly execute the function of product shipping. The functions like routing help in delivering the products to specified locations without lapse. Tracking of delivery is also effectively carried under ERP solutions. If you are interested in Odoo ERP for your business, kindly drop your message to info@cybrosys.com. We can guide you better in Odoo support for executing your organization goals.